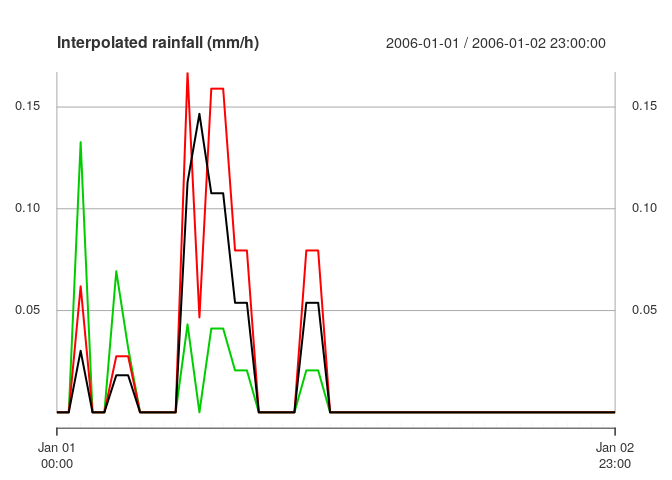 Reading and writing Ensemble Forecast Time Series in netCDF files. Plain text files are not well suited to storing the large volumes of data generated for and by ensemble streamflow forecasts with numerical weather prediction models. netCDF is a binary file format developed primarily for climate, ocean and meteorological data. netCDF has traditionally been used to store time slices of gridded data, rather than complete time series of point data. efts is for handling the latter. This is an extract from one of the package vignettes. rain_dat has methods to discover and retrieve data in the file. #>  "area"          "lat"           "lon"           "rain_der"
#>  "rain_der_qual" "station_id"    "station_name"  "x"
rain_der in this instance has two dimensions, but even if it had been defined as a 3 or 4 dimension data, or in different orders, the method get_all_series just does the low-level processing to present a meaninful multivariate xts series. #> Warning: timezone of object (UTC) is different than current timezone (). xts may insist on warning that the "timezone of object (UTC) is different than current timezone ().". This is normal and the series is exactly as it should be. You should use the close method once you are done with accessing the data set object and its underlying netCDF file.